“What the heck?” Behind the Master Class Area was a giant tan-colored hooded construction, looking like a giant Zamboni machine and labeled “Wynn Audio,” with a viewing window at the front. Sticking my head under the enclosure, all was revealed. 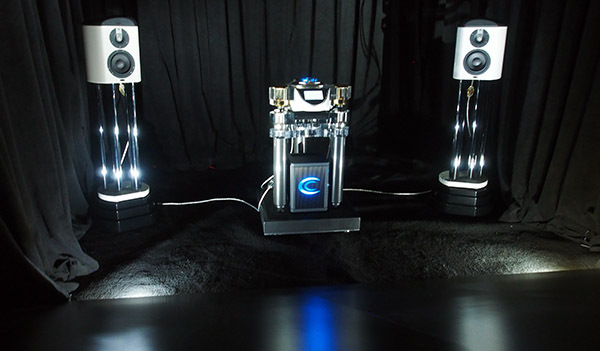 A pair of the Crystal Cable Arabesque Minissimo Diamond minimonitors ($19,995/pair with stands) that I reviewed in October 2016 was being driven by Crystal’s 180Wpc CCi integrated amplifier, with source a Kalista DreamPlay One CD player ($43,000), all connected with Crystal’s 15th anniversary Future Dream cables, which combine monocrystal silver and silver/gold alloy conductors insulated with Kapton and Teflon. Considering the unusual acoustics, the sound was what I expected from these little gems: detailed and clean, with palpable imaging. 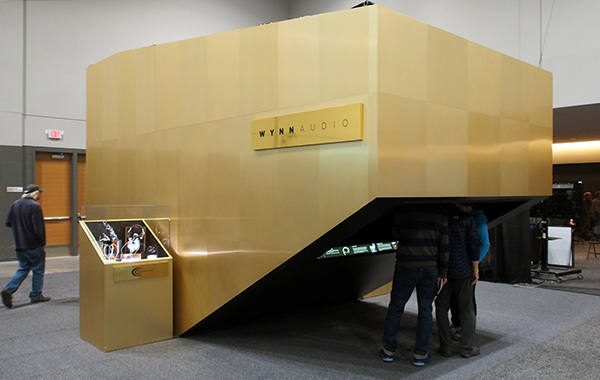 Jason Victor Serinus reports on the sound in the main Wynn Audio room elsewhere in this show report.